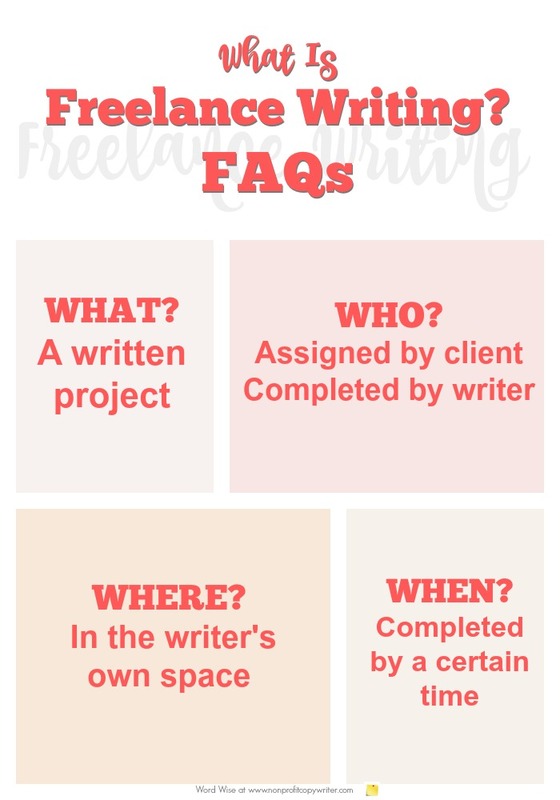 I had a lot of questions about freelance writing when I started out ... and many of you have asked me these same questions, too. It is project-based text work, assigned and paid for by a client, and completed by a writer by a specific time. It is an assignment for a specific piece to be completed by a specific time. It is assigned by and paid for by a client. It is completed by a writer engaged per project or service. A freelance writer is a self-employed writer who produces text in exchange for pay. Freelance writers are business owners. Successful freelancers not only write but learn business and marketing skills to get, keep, and manage a steady stream of work. Freelancers work independently. They choose when and where they complete their work, while a permanent staff writer produces written content during specific office hours and while working at a particular location. Freelance writers use their own equipment; permanent staff writers use corporate equipment. Freelancers work for a variable number of clients. A freelancer may have one client or many clients at any one time; a permanent staff writer works for one client. Freelance writers often specialize in one topic or subject, called a niche, such as health, finance, or education. Freelancers write whatever text their clients need, including creative, technical, feature, marketing, communications, business, SEO content, copywriting, and grant writing. Projects may include ads, articles, blog posts, business documents, applications, brochures, case statements, eBooks, email campaigns, guides, letters, memos, newsletters, PowerPoint presentations, resumes, speeches, web content, white papers, and more. A writer may specialize in one kind of writing, such as internet content or B2B copywriting. Freelance writers may be contracted to provide additional services for a client, including loading web content, posting on social media, managing email campaigns, and conducting strategic planning. Some freelance writers also produce simple graphics for a client. Freelancers work for small businesses, non-profits, ministries, political organizations, website owners, magazines, publishers, large corporations, colleges, local governmental offices, ad agencies, marketing agencies, and individuals. How Does a Freelance Writer Get Work? There are as many ways to get work as there are clients, but they can be grouped into two categories. You seek out work. There are plenty of ways to market your freelance services: sending out inquiry packages, targeting one niche, seeking out gigs on the internet, sending pitches to editors, cold calling. Clients seek you out. Clients who need a writer contact you via your website, social media, your newsletter, search engine results, or referral. As you begin to specialize in your niche, more clients seek you out. Once finished with a project, the freelancer sends the client an invoice. The client pays by check, PayPal, or other electronic interface.